Officially it’s called 3rd league, but let’s not diminish their achievement, Widzew are a 4th league club. Having lived through the horror of degradation to 5th league, they’re gradually rebuilding their position in Polish football. 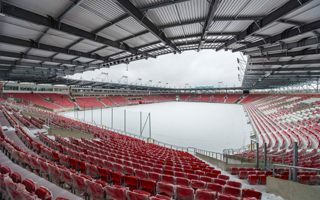 Well before anyone thought Widzew would collapse from playing in Ekstraklasa (until 2014) to becoming a local side, the city began planning and construction of their new stadium. We covered its progress here at StadiumDB, now the $34-million 18,000-seater is ready for action. In December we wrote how they managed to sell 5,500 season tickets, which is one of the best results throughout Poland. Now that number is at 10,142 and growing by the day. And make no mistake, they haven’t set low prices for their seats. Season ticket of $28-71 is the level of Polish top flight, while Widzew will actually play reserve teams of Ekstraklasa sides at their new stadium. As of last week the south stand, dedicated to most vocal supporters, is considered sold out. Seating 3,200 people, this stand has 3,000 season tickets sold. The remainder will be offered to fans from fanclubs spread across the region. This means it will be almost impossible to buy a single-game ticket to that section of the stadium. Also worth noting, Widzew supporters funded almost 1,000 suspended season tickets. The idea is similar to Italian “caffè sospeso”. One person pays, another one receives the season ticket. In this case Widzew, in partnership with their supporters trust, will award these season tickets to young and vulnerable fans. Now the next goal set by Widzew is the sale of 12,000 season tickets. They have an extra incentive for their fans, too: if they reach it, they will surpass archrivals Legia Warszawa as Poland’s leaders in terms of season tickets (Legia sell over 11,000).